With the development of petroleum industrialization, the pollution problem brought by the drilling process has received more and more attention. At present, there is no recognized effective treatment process suitable for drilling waste liquids in China, mainly because of the wide variety of drilling fluids and working fluid systems, complex compositions and different usage conditions. Techniques that result in waste fluids for a particular type or region of an oil field are not necessarily suitable for use with other types or regions of waste. In addition, compared with the current comprehensive level of sewage treatment in the petroleum industry, the treatment cost of drilling waste liquid and wastewater is relatively high, and the treatment effect is general. Overall, the current drilling wastewater treatment technology is still far from satisfactory. 3, the continuity processing device is not targeted, the processing cost is high, and the treatment plan is popularized in a large area. The main core equipment of the system is vibrating screen for high-G shale shaker and high-speed decanter centrifuge (according to the situation with 20-foot flocculation dosing system to improve the treatment effect of the centrifuge), and the system supporting feeding screw pump and armoring treatment. Tank, agitator, etc. According to the specific requirements of the customer for the discharge, make targeted adjustments to ensure that the discharge meets the customer’s expected treatment effect. 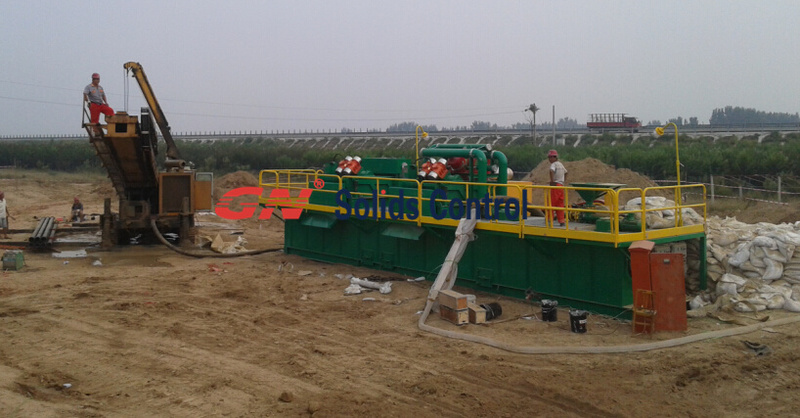 The clean production drilling fluid purification equipment developed by GN Solids Control can effectively reduce the generation of drilling waste, reduce the amount of waste liquid generated by 30~50%, effectively reduce the cost of harmless treatment, and minimize the Environmental pollutants are produced.